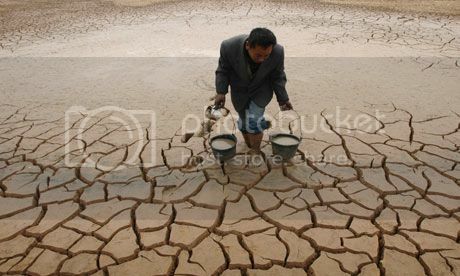 A man in China hauls two buckets of water during a severe drought. Ongoing, frequent droughts represent a huge threat to China’s agricultural industry. Although the Earth is composed of 70% water, only 0.7% (or 1% of the total supply) of it is fresh and potable, which presents a considerable resource challenge for a growing population expected to hit 9 billion people in 2050. In a profile series of some of the world’s most populous metropolises, Last Call vividly demonstrates that stark imagery of shortage crises is no longer confined to third world countries or women traveling miles with a precious gallon of water perched on their heads. The Aral Sea, a critical climate buffer for Russia and surrounding Central Asia neighbors, is one-half its original size and devoid of fish. The worst global droughts in a millennium have increased food prices 10% and raised a very real prospect of food riots. Urban water shortages, such as an epic 2008 shortage that forced Barcelona to import emergency water, will be far more common. The United States, by far the biggest consumer of water in the world, could also face the biggest impact. Lake Mead, the biggest supplier of water in America and a portal to the electricity-generating Hoover Dam, is only 40% full. Hoover Dam, which stops generating electricity when water levels are at 1050 feet, faces that daunting prospect in less than 4 years! One strength of Last Call is that it is framed around a fairly uniform and well-substantiated hypothesis: water shortage is directly related to profligate, unsustainable water usage. Some usage, such as the 80% that is devoted to agriculture and food production, will merit evaluation for future conservation methods. California and Australia, two agricultural behemoths half a world apart, both face similar threats to their industries. But others, such as watering lawns. are unnecessary habits that can be reduced or eliminated. Toilets, most of which still flush 6 gallons in a single use, are the single biggest user of water in our homes—6 billion gallons per day! The US is also the largest consumer of bottled water in the world, with $11 billion in sales, even though bottled water, unlike municipal tap water, is under the jurisdiction of the FDA, not the EPA. As chronicled in the documentary Tapped, 45% of all bottled water starts off as tapped water, and has been subject to over 100 recalls for contamination. 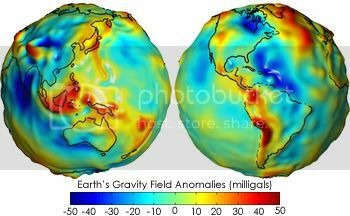 Gravity field anomalies measured through the GRACE Satellite provide information about changes in the Earth’s water levels. A cohort of science and environmental experts bolsters Last Call’s message with the latest scientific research in the area. NASA scientists at the Jet Propulsion Laboratory are using a program called the Gravity Recovery and Climate Experiment (GRACE) Satellite to measure the change in oceans, including water depletion, rise in sea levels and circulation through a series of gravity maps. Erin Brockovich, famously portrayed by Julia Roberts in the eponymous film, appears throughout the documentary to discuss still-ongoing issues with water contamination, corporate pollution and lack of EPA regulation. UC Berkeley marine biologist Tyrone Hayes expounds on what we can learn from genetic irregularities in amphibians found in contaminated habitats. Indeed, chemical contamination is the only issue that supersedes overuse as a threat to our water supply. Drugs, antibiotics and other chemicals, which cannot be treated at sewage treatment plants, are increasingly finding their way into the water supply, many of them at the hands of large corporations. Between 2004 and 2009, there were one half a million violations of the Clean Water Act. Last Call doesn’t spare the eye-opening details that will make you think twice when you take a sip of water. Atrazine, for example, is the best-selling pesticide in the world, and the most-used on the US corn supply. Unfortunately, it has also been associated with breast cancer and altered testosterone levels in sea life, and is being investigated for safety by the EPA, with a decision expected in 2013. More disturbing is the contamination from concentrated animal feeding operations (CAFOs) near major rivers and lakes. Tons of manure from cows, one of which contributes the waste of 23 humans, is dumped into artificial lagoons that then seep into interconnected groundwater supplies. 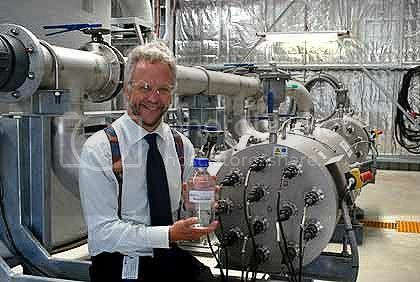 A scientist holds a bottle of water filtered and purified through reverse osmosis at a sewage recycling plant. Would you drink it? It’s not all doom and gloom with this documentary, however. Unlike other polemics in its genre, Last Call doesn’t simply outline the crisis, it also offers implementable solutions and a challenge for an entire generation of engineers and scientists. At the top of the list is a greater scrutiny of polluters and the pollutants they release into the water supply without impunity. But solutions such as recycling sewage water, which has made Singapore a global model for water technology and reuse, are at our fingertips, if developed and marketed properly. The city of Los Angeles has already announced plans to recycle 4.9 billion gallons of waste water by 2019. Last Call is an effective final call to save a fast-dwindling resource through science, innovation and conservation. Last Call at the Oasis went out on DVD November 6th.